Longtime member John Haikings gave a brief account of his presentation to The Historical Association of Annapolis Royal seventy years ago as a young lad when he was sent to Nova Scotia from England during World War II in 1941. His lovely bride of 54 years, Margaret, was by his side. John told how Margaret had worked as a secretary for his wartime foster father, Dr. A.D. Pickett. She typed John’s immigration papers and wondered if she would ever meet him. They got married 5 years later, and as they say, the rest is history. Special Guest Speaker was Richard “Chuck” LeCain, the 5th great grandson of Francis Barclay LeCain. 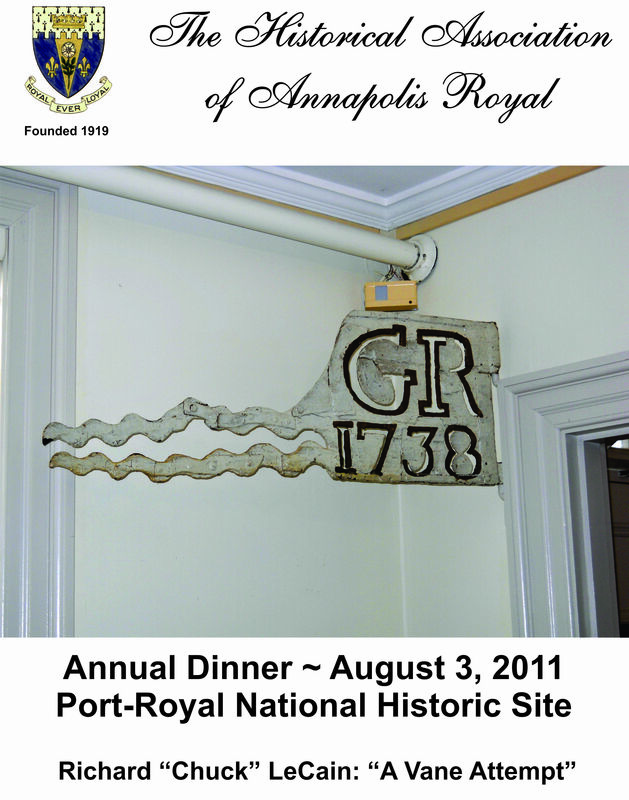 Oral history indicates that the GR1738 weathervane on display at Fort Anne National Historic Site (one of the oldest surviving metal works in Canada) was made by Francis Barclay LeCain. Francis arrived in Annapolis Royal in 1740, and by the time of his death in 1806 he was the oldest settler in Annapolis County. He had witnessed all the town’s stirring events during that period and left more than 100 descendants. The LeCain family operated a blacksmith’s forge on Lower George Street for three generations. His son, master builder Francis LeCain, constructed the old Annapolis courthouse in 1837 which still is in use today. Chuck’s presentation discussed the life of Francis Barclay LeCain generally, but more specifically it also highlighted two artifacts left by the LeCain family. One was a sampler, done by his wife Alicia Maria Hyde, that perhaps is the oldest English sampler known from the area. The other was the weathervane made by Francis Barclay LeCain, which was secured for the museum at Fort Anne in 1923 by L.M. Fortier, the first President of The Historical Association of Annapolis Royal. Richard ‘Chuck’ LeCain’s love of history was inspired and nurtured at a young age by his 9th and 10th grade history teacher at King’s Edgehill School in Windsor, The Historical Association of Annapolis Royal’s own Jim How, Past President and member of the Executive Staff and Board of Directors. Chuck graduated from St. Mary’s University in Halifax with a Bachelor of Arts (History Major) in 1972 and received his Bachelor of Education in 1974. He began his teaching career at Kings College School in Windsor in 1974 where he was a History Teacher, Senior High Bridgewater Jr./Sr. High School from 1975 – 2004 and later also served as the school’s History Department Head from 1980 – 2004. Some of Mr. LeCain’s Professional Achievements and Activities include NSCC Consultant 2006-2009, Dept/Education Task Force on Canadian History Curriculum 2000 to 2002, South Shore School Board, Canadian History Implementation Team 2002-03, Manuscript Reviewer for Gage text ‘Canada’s History’ 2001-02, Canadian Representative Japanese Education Exchange – 1997, Vice-Chairman, Heritage Advisory Committee – 1990 to 1994, Heritage Advisory Committee – 1989 to 1994, Dept/Education Canadian History Correspondence Course Development – 1989, Consultant for McGraw- Hill Canadian History Text – 1988, Community Service Award, Town of Bridgewater – 1986, Quality Education Award – 1984, 1990, 1994. This entry was posted in Explore Annapolis Royal, Heritage and tagged Durline Melanson, Explore Annapolis Royal, Fort Anne, Habitation, Historical Association of Annapolis Royal, Port-Royal National Historic Site, Richard "Chuck" LeCain. Bookmark the permalink.